Good posture is so critical for mood and spine health. When you collapse your chest and neck, you also compress your lungs causing shallow breathing – it becomes a habit, as does the curved alignment of your spine. Add 40 years and you’ll face spinal issues for the rest of your life. So sit up straight and start yoga and/or tai chi / aikido, and maybe even Alexander or feldenkrais posture training. I did and it made an amazing difference. My chiro says my spine is better now than 10 years ago. There’s growing evidence that good posture contributes to a range of health benefits, from reducing back and joint pain to boosting mood. Health-care practitioners from physical therapists to surgeons to psychologists increasingly take posture into account when evaluating patients, and offer tips and tools for improvement. Good posture doesn’t just mean standing with the shoulders thrown back. More important is maintaining good alignment, with ears over the shoulders, shoulders over hips, and hips over the knees and ankles. Body weight should be distributed evenly between the feet. 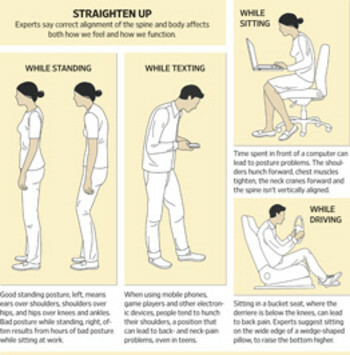 Seated posture, especially while using a computer, is critically important and deserves more attention, experts say, in part because it can affect a person’s posture while standing and walking. Experts say it is essential to think about posture while walking, getting up out of a chair or using a cellphone or tablet. ← Find The Best: Research Thousands of Topics and Compare Products Instantly.